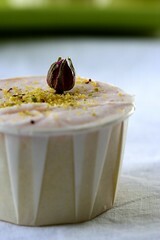 This recipe is inspired by a delicious dessert I had when I was last in India. I actually didn’t know the name of the dessert, but I described it to my coworker and she informed me that what I had was Gajar Halwa or carrot pudding. I considered two preparations, one where I made the pudding and stuffed cupcakes with it and the second where I made the pudding and put it directly in to the batter. I opted for the second, simpler preparation. We were having an amazing weekend in San Francisco and I didn’t want to spend it all indoors. 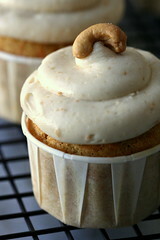 These cupcakes are delicious and completely edible (meaning I could eat and eat them). 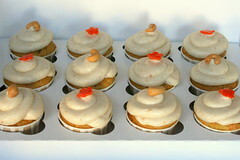 The cake is much like a typical carrot cake, but mellower. 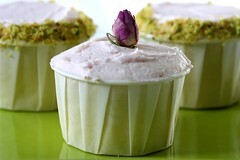 Otherwise, it is just as moist and very flavorful with the crunch of the cashews and slight spiciness of the cardamom. The frosting is scrumptious. I am a fan of cashews and I am very happy with how this recipe came out – creamy, not too sweet, slightly tangy, and very “cashewy”. 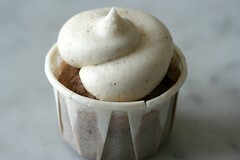 Together the cake and frosting result in a perfect mid-morning or afternoon treat – satisfying without overwhelming. 1. Peel, rinse, and grate the carrots with a fine grater. 2. Sauté the carrots in clarified butter for 3 minutes. Add the water, bring to boil, cover and simmer for 3 minutes. 3. Remove the lid. Stir to cook off any remaining water. 4. Add the milk and cardamom pods. Simmer for 15 minutes stirring occasionally. 5. Add 1/2 cup of sugar and stir to dissolve. Simmer for 5 more minutes. You could stop here and have some yummy pudding to eat with vanilla ice cream. 6. Remove of the heat and allow to cool to room temperature. I spread the mixture on a sheet pan so it would cool faster. 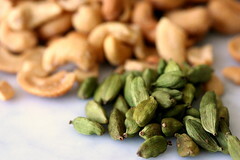 Remove cardamom pods. 7. In a large bowl, mix together the cooled, cooked carrot mixture, eggs, vanilla, 1-1/2 cups sugar, vegetable oil, and milk. 8. In another bowl, whisk together flour, baking powder, baking soda, salt, and cardamom. 9. Stir the flour mixture into the carrot mixture. Continue to stir until combined. 10. Add the chopped cashews and stir to combine. 11. Scoop out into cupcake papers about 2/3s full. This will give you a nice dome that won’t overflow, so long as your oven is hot enough. 12. Bake at 350 degree oven for ~25 minutes or until toothpick comes out clean. 1. Grind the cashews for a few pulses in a food processor to break them up. 2. 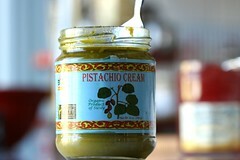 Add two tablespoons of oil and continue to pulse until the nuts start to get creamy. Add more oil, 1 teaspoon or so at a time, until you get to a creamy consistency like chunky peanut butter. 3. Beat the butter and cream cheese at medium speed until creamy. Add the cashew butter and beat to combine. Scrape the bowl. 4. Sift 3 cups of the powdered sugar into the bowl. Beat to combine. 4. Add more sugar until you get to the consistency and sweetness you like. 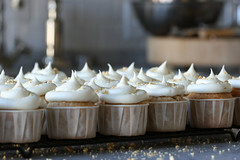 Note: If you add too much sugar and the frosting gets too thick, simply add a tablespoon or so of milk to soften it up. 1. 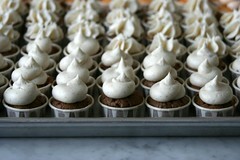 Frost the cooled cupcakes. 2. Garnish with a cashew or candied carrot. I have heard of Jackfruit. After all, I do live in San Francisco and get exposed to a variety of “exotic” ingredients. 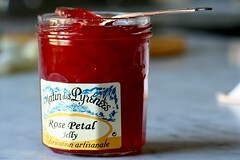 This was, however, my first time tasting it and to be honest, I am not sure how to describe it. I am told that I need to try the real (fresh) jackfruit as opposed to canned (canned was admittedly what I had on hand), but have also been warned of the amount of work it involves to wrangle one into submission. I have since learned that many Asian grocery stores sell manageable chunks of fresh jackfriut, so I wouldn’t have to commit to a large whole one. 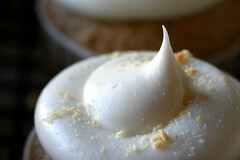 So, while I can’t easily compare jackfruit to something familiar to the US palate, I will describe the resulting cupcakes as tasty starting off with a hint of banana then rounding out with a jackfruit or “tropical” flavor. They are dense and muffin-like with definite chew and crunch. The cake could be lightened up some by cutting back some on the jackfruit and peanuts. 1. Whisk flour, baking powder, salt, cinnamon, and sugar in a medium sized bowl. 2. In a separate medium sized bowl bowl, beat eggs to break up. 3. Add oil, coconut milk, and vanilla to the eggs and mix to combine. 4. Add the wet ingredients to the dry ingredients, mix to combine. 5. Add jackfruit, mashed bananas, and peanuts to the rest of the ingredients and mix to combine. 6. Scoop into cupcake papers about 2/3s full with an ice cream scooper. 7. Bake at 350 degree oven for ~25 minutes or until a cake tester comes out clean. 4. Add 4 cups of the powdered sugar and beat until combined. 2. Chop some unsalted peanuts with salt. I must admit… I almost felt like I was cheating with this recipe. 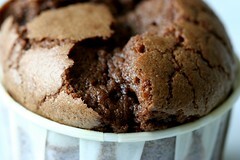 I used my current favorite chocolate recipe and added a few teaspoons of ground up spices – that was it! Just goes to show you… with a great base recipe and a rummage through the spice rack or pantry, anyone can come up with an interesting and tasty concoction. Days later, my husband is still talking about them and they seemed to be a hit at the art opening I made them for. 1. With a small food processor, grind up the whole fennel and cloves. 2. Transfer to a small bowl and add remaining spices. Mix to combine. 6. 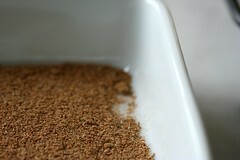 Sift the flour, cocoa powder, baking powder, chai spice mix, and a pinch of salt into the mixture and mix until blended. 2. Add 4 cups of sifted powdered sugar, milk, spice mix, and ginger. Beat until combined. Note: Everyone’s personal preferences differ. With frosting, the flavor is up to you. If you are unsure of how much of a chai flavor you want, start light on the spices and add a teaspoon at a time until you get to a flavor you like. Same goes for the sugar. It’s a matter of taste and what consistency you want to work with. Experiment until you get at what works for you.